A Total on 155 Government Post, under the Chief medical Officer (CMO), Dhenkanal, Odisha are open for recruitment. The Number of posts are as Follows with there Eligibility criterion. Staff Nurse (107 Posts) Eligibility: candidate should have completed Diploma in GNM/B.SC Nursing courses from a recognised institution and must be registered under Orissa Nursing council. Laboratory Technician (06 Posts) - Eligibility : candidate should have completed Diploma in Medical Laboratory Technology (DMLT) courses from a recognised institution. Radiographer (04 Posts) Eligibility: candidate should have completed Diploma in Medical Radiation Technology (DMRT) courses from a recognised institution. MPHW (Male)(3 Posts) /MPHW (Female)(35 Posts) :Eligibility : candidate should have completed Diploma Pharmacy course, from a recognized institution and should be registered on Orissa Pharmacy Council. 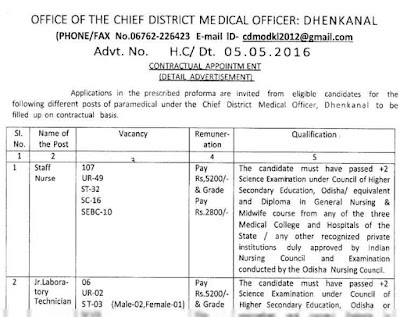 ‘the Office, Chief medical Officer, Dhenkanal’ on or before 20 May 2016 (1PM).